Yi Peng is a festival celebrated by the Lanna people of Northern Thailand --it originally was to honor the Buddha; however, in recent years it has become a popular tourist attraction. 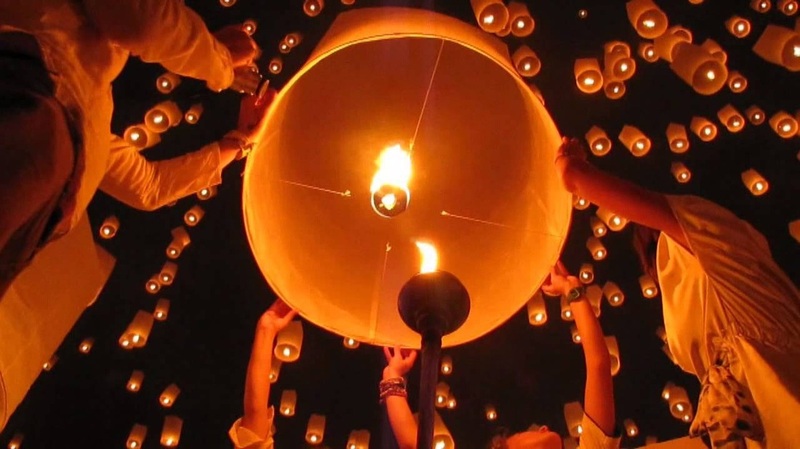 The sky lanterns -- known as khom loi -- are made from rice paper and are heated by a fuel disk. When done correctly, the large lanterns fly surprisingly high, and often look like fiery stars at their peak altitude --the sky lanterns are sold everywhere. Messages, prayers, and wishes for good luck are written on the lanterns before launch. 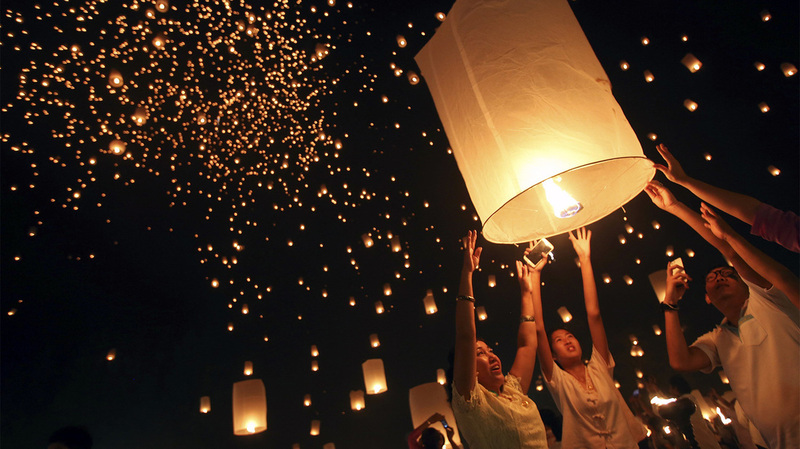 The lanterns fly high enough to look like stars. 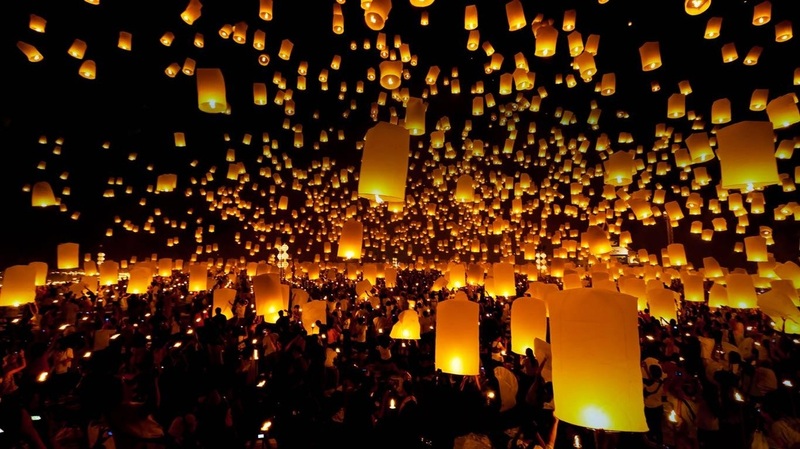 Today, you can find sky lantern festivals in many places around the world--including Disney's, "Tangled!" 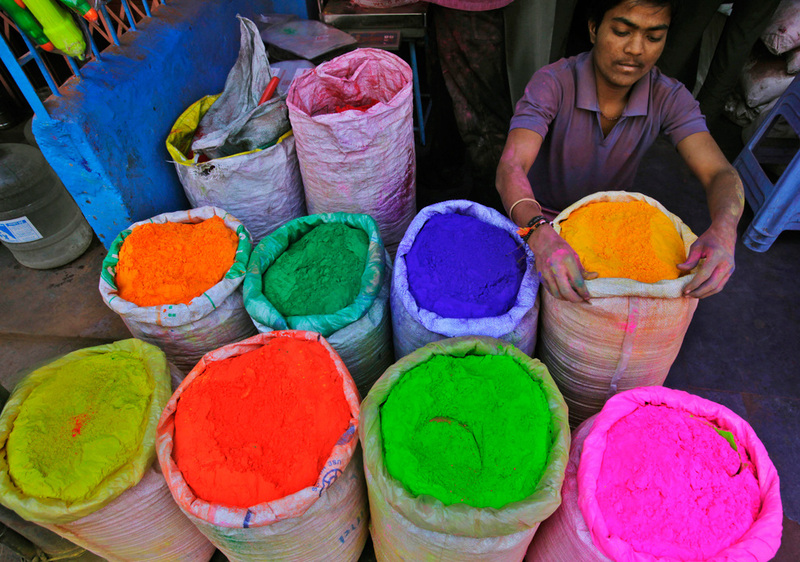 DAY 2 - HOLI COLOR FESTIVAL (INDIA): Holi is the Hindu festival of colors. 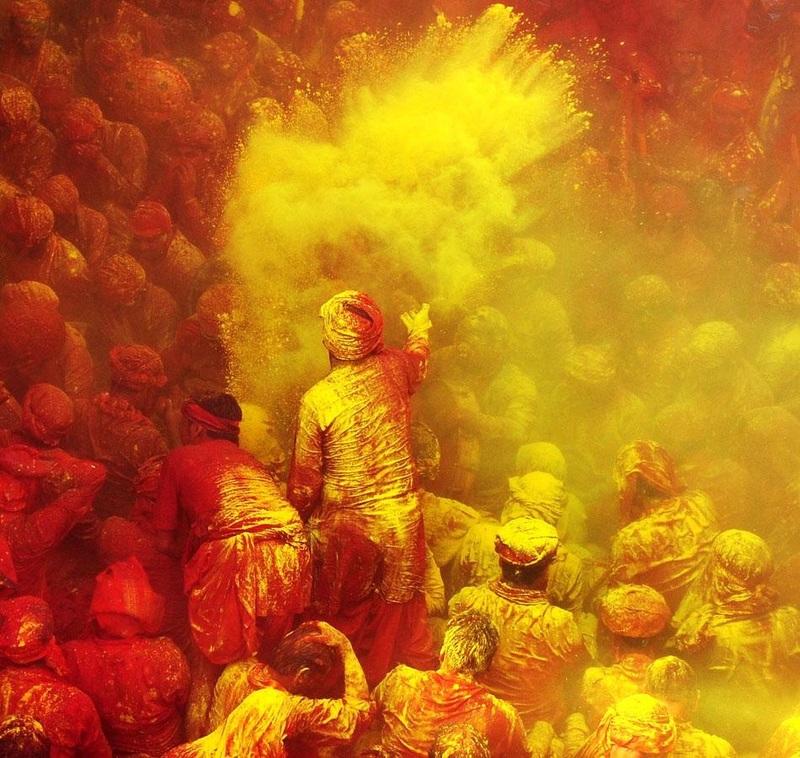 On the day of Holi, people throw colored powder and liquids at each other. 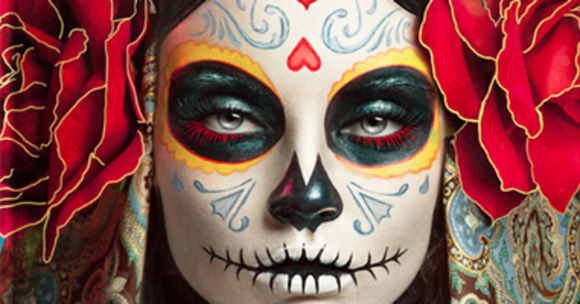 A common greeting during this time is, "Happy Holi." 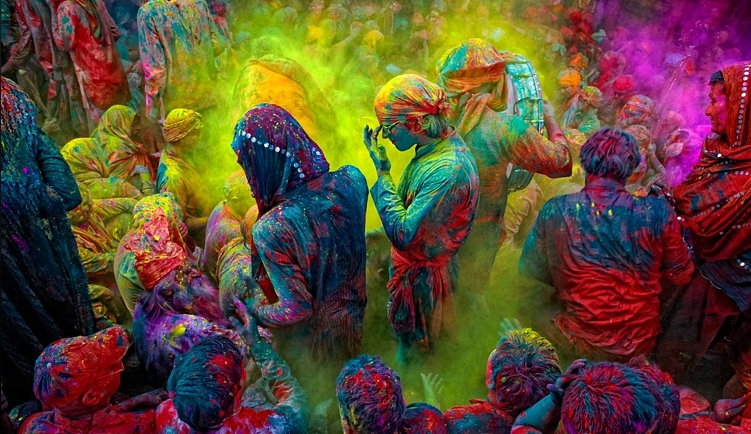 The Holi festival commemorates the victory of good over evil. 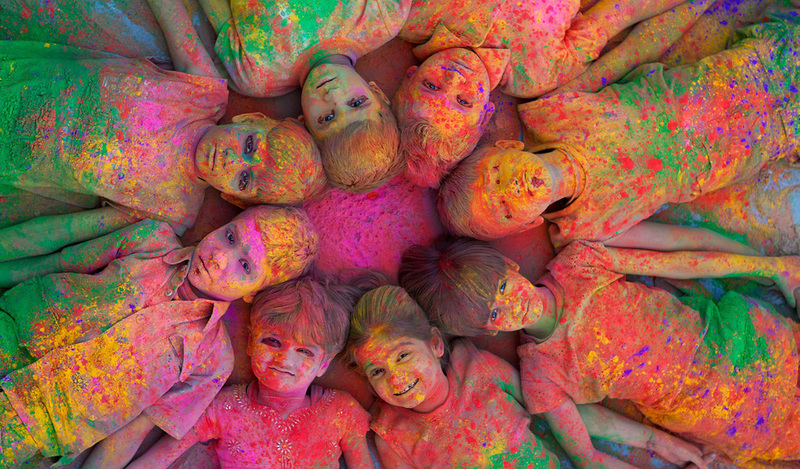 Today there are spin-offs of Holi called color runs in our country. 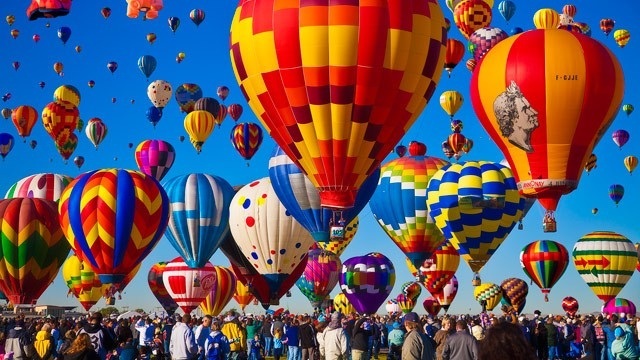 We even had a festival of colors here at Weiner High School several years ago. 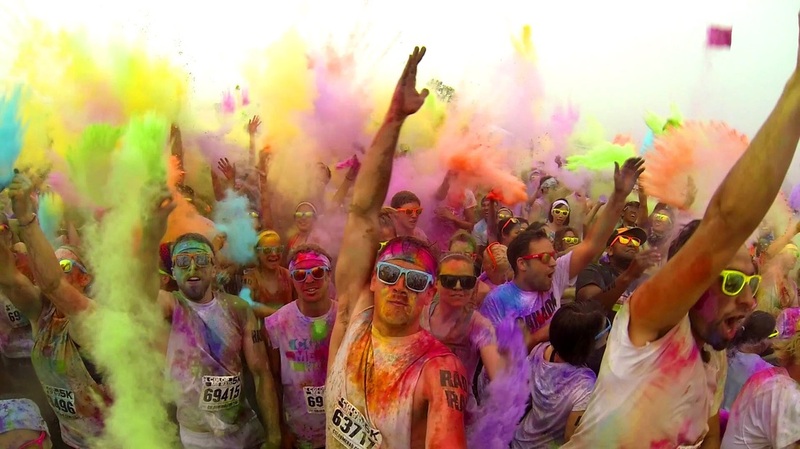 Few people know the color runs actually were borrowed from the Holi Color Festival in India. 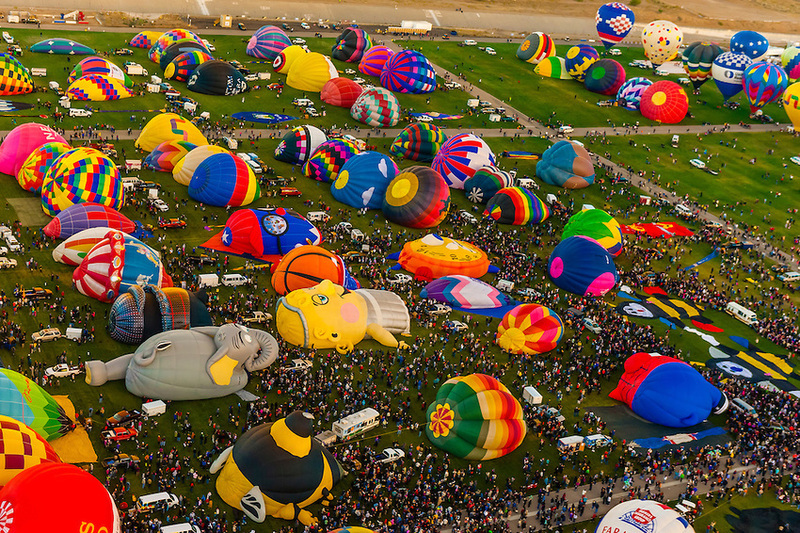 This gives you an idea of just HOW MANY balloons are there! 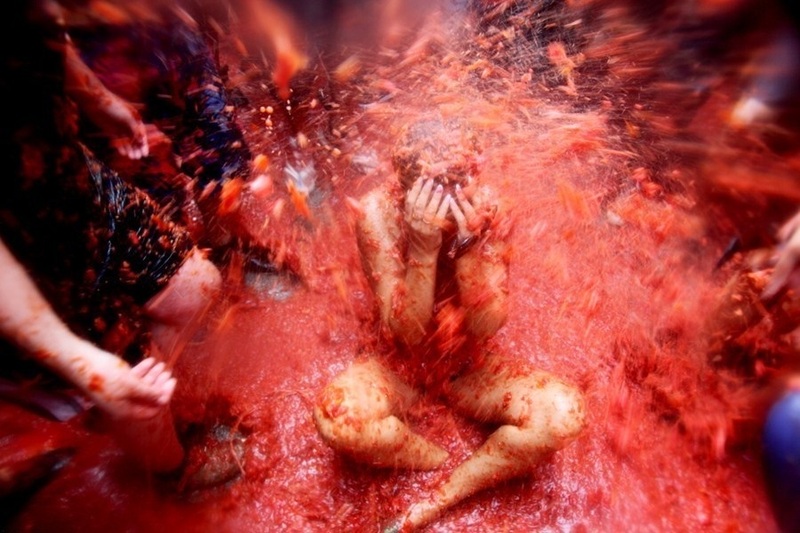 DAY 4 - LA TOMATINA FESTIVAL (SPAIN): La Tomatina is a food fight festival held on the last Wednesday of August each year in the town of Bunol in Spain. 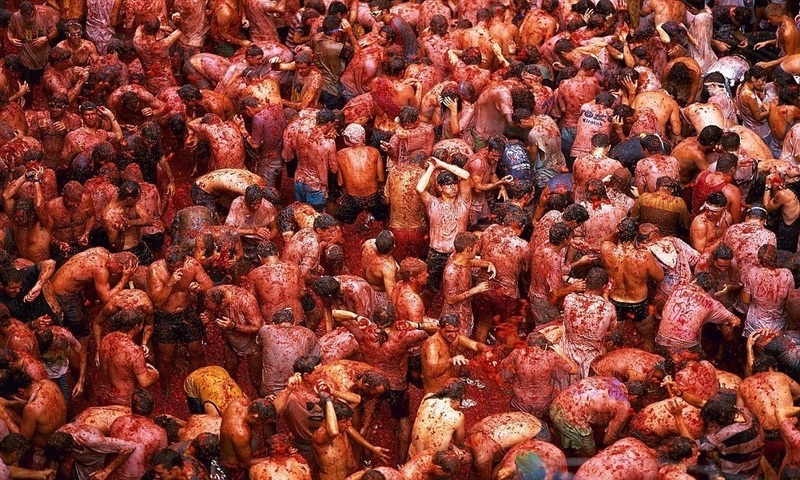 Thousands upon thousands of people make their way from all corners of the world to fight in this 'World's Biggest Food Fight' where more than 220,000 pounds of over-ripe tomatoes are thrown in the streets. The signal for the beginning of the fight is firing of the cannon, and the chaos begins. Once it begins, the battle is generally every man for himself. 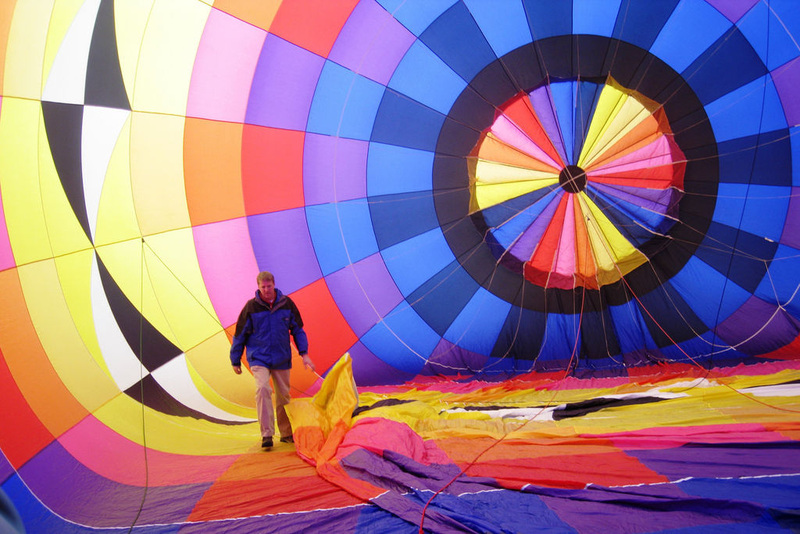 Those who partake in this event are strongly encouraged to wear protective safety goggles and gloves. 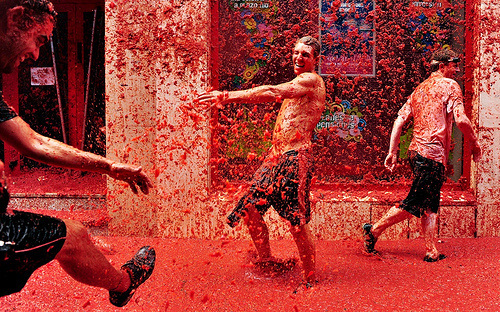 In addition, they must squish the tomatoes before throwing for safety precautions. Another rule is that no one is allowed to bring into this fight anything that may provoke someone into a more serious brawl, such as a glass bottle. It is highly frowned upon to tear someone else’s clothing. Somewhere between an hour and two hours, the fighting ends and the cannon is fired once more to signal the end. At this point no more tomatoes can be thrown. The cleaning process involves the use of fire trucks to spray down the streets, with water provided from a Roman aqueduct. 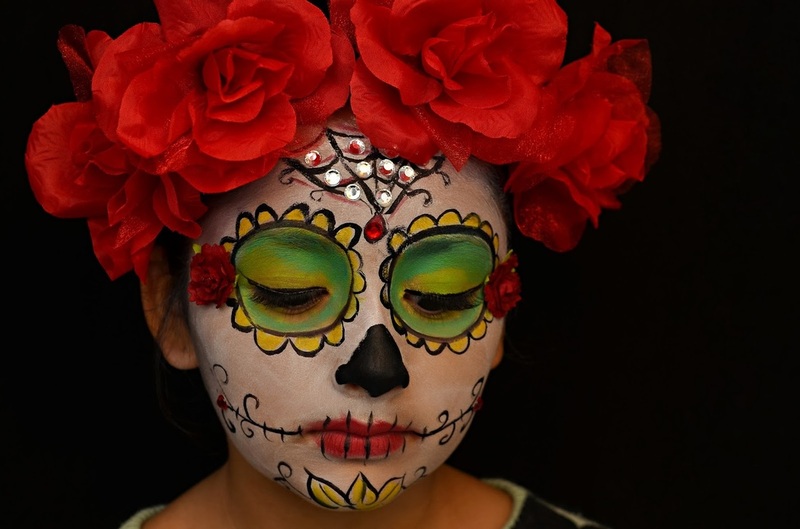 DAY 5 -Dia de los muertos (Day of the Dead) - Mexico : is a Mexican holiday celebrated throughout Mexico and around the world in other cultures. The holiday focuses on gatherings of family and friends to pray for and remember friends and family members who have died. 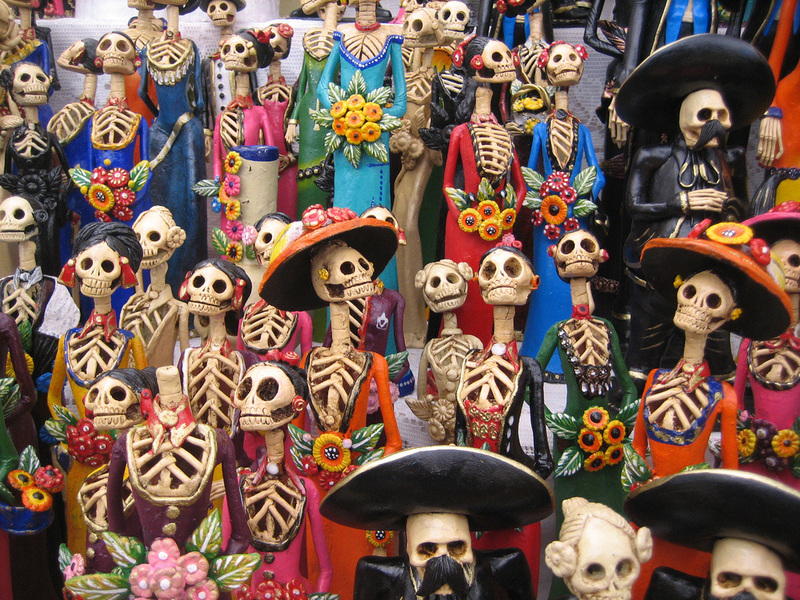 It is particularly celebrated in Mexico where the day is a bank holiday. 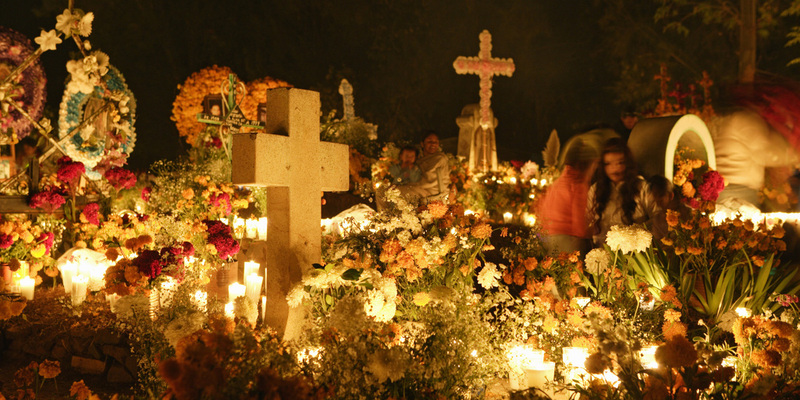 Traditions connected with the holiday include building private altars called ofrendas, honoring the deceased using sugar skulls, marigolds, and the favorite foods and beverages of the departed, and visiting graves with these as gifts.